Hey mama, do you find it difficult to get out of bed in the morning? 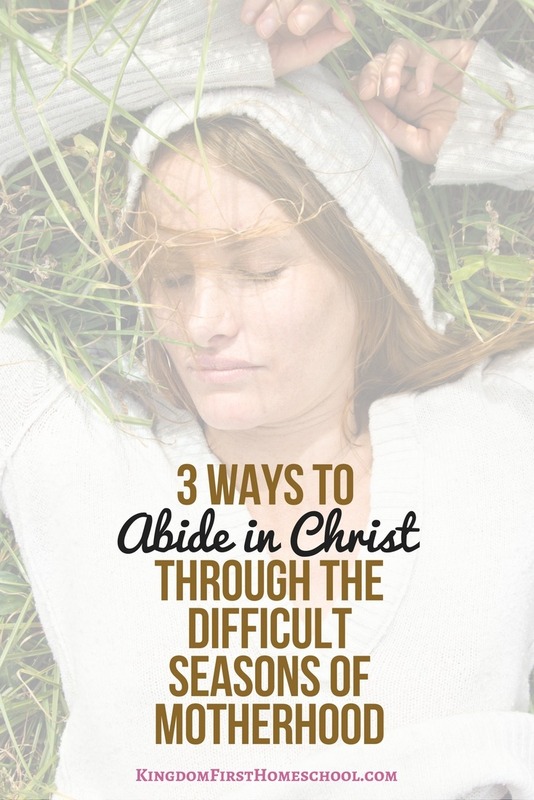 Are you making time to Abide in Christ? 6 AM rolls around and you roll over again and again and push snooze, dreading to start the busy day. The craziness of recent days pops into your thoughts as soon as you open your eyes. Cereal spills, missing shoes, nothing to wear, whining, fussing, arguing, grocery shopping, deadlines, homeschooling drama, cooking, cleaning, laundry and the list goes on and on! There are a whole lot of us moms that are just surviving day to day, living joyless, peaceless and lacking contentment or purpose. I’ve been there and still often find myself back in seasons of this mundane way of living. I’m a homeschool mom and when I first started homeschooling, it took me awhile to realize that I wasn’t taking the time to abide in Christ. I thought I could do it all on my own, without Him. I soon learned that as I strived to teach my children, my way, the way I was taught, it was difficult. We were stressed instead of walking in peace. I was driven by fear. My big mistake was I thought my homeschooled kids had to perform at a higher level. I got caught up in the dreaded comparison trap. We were being scrutinized by public school families around us. I felt like I had to prove myself, my worth to teach them. People were judging and testing us at every turn. What’s 2+2? Can you tie your shoes yet? How many do you see? Can you count? Can you tell time? Ugh! Enough! But, I did let the fear drive me for awhile. They had the best curriculum, that they were being taught every subject daily for as many hours as public school was in session. I was still in the rat race of public school in my own home. I was literally force feeding them as much information that I possibly could, so they would be on the fast track to college. Really? Come on it’s preschool & kindergarten. What was I thinking? They were overworked and actually weren’t learning anything. Joyless, peaceless and without contentment or purpose. All I knew was God wanted me to homeschool. Didn’t think to ask Him how? Finish Reading this post and find out 3 Ways to to Abide in Christ Through the Difficult Times of Motherhood over at the 31 Days of Motherhood Encouragement Series at my sweet friend Tatiana’s blog, The Musings of Mum! Also you can join the private facebook group too.